Because of the refined design of the shoe, majority of the users prefer to wear this classic as a sneaker. Newcomer Puma Clyde Court Disrupt receives the same exposure as a welcome from the sneaker community. The Phylon Technology for the midsole makes the shoe lightweight and responsive. Many reviewers recommend purchasing a pair of the limited edition Nike Air Zoom Generation to huge LeBron James fans. Majority of the reviewers agree that this shoe model does not need time to break in. Though this shoe model does not have the modern Flyknit technology, users still recommend using this for the comfort that it brings. Multiple users praise the durability of the shoe, considering that they have worn a pair for over ten years both on and off court. A reviewer shares that there are a lot of different Nike Air Zoom Generation colorways to choose from, but his favorite is the King’s Rook. It looks really good on foot. Compared to the other colorways, it has a cleaner look as well. Some reviewers mention that the outsole cannot withstand rough surfaces like outdoor courts despite the herringbone pattern for traction. A lot of reviewers say they go true to size but there are a few ones with wide feet who went up half a size. Wearers have mentioned that the glossy mirror-like feature on the heel counter will flake off over time. A small number of Nike Air Zoom Generation owners mention that the leather upper feels crappy. Several buyers demand for the shoes to be more available. It is not available in retailers the same way the 16th LeBron James shoes are. The Nike Air Zoom Generation is quite expensive. If the user is a shoe collector and a big follower of LeBron James, this is a must-have and should not come as an easy pass. This signifies the beginning of this amazing basketball player’s brilliant career. The Nike Air Technology is used to provide cushion to players while running on the court. People buy shoes for a lot of different reasons. Style-wise, these are better worn casually due to its creative aesthetic. It is surprisingly comfortable straight out of the box. Overall I’m very happy with this retro take on Lebron’s very first Nike sneaker. This is my personal favorite colorway for the zoom generation line and I’m happy overall with the materials and quality of the build of this shoe. Would I recommend wearing a shoe from 2003? From my experience, the AZG has held up well as have my Lebron II and III but based on Swaggy’s experience I’m not so sure. The greatest LeBron model in my opinion. Nike and LeBron James partnered in 2003 to produce the famous Nike Air Zoom Generation. It is recognized as the first of the many signature basketball sneakers for LeBron James that commenced an extensive line of innovative footwear. The design was created by masterminds Aaron Cooper, Eric Avar, and Tinker Hatfield. Fast forward to fourteen years later, Nike is again putting in the market a few pairs of the first Air Zoom Generation shoes that LeBron played in. This shoe model is designed for comfort, performance, and beauty; and it is inspired by the modern-day soldier and the black fully customized Hummer H2 given to LeBron by his mother on his 18th birthday. Just like the first AJ sneaker, the Air Zoom Generation comes in different renditions throughout the years. Cushion. The Air technology was among the first technologies used by Nike to promote their line. Nike innovated on this technology. Used on this shoe, the benefits include lightness, versatility, cushioning, and durability. The technology is comprised of pressurized air inside a tough, flexible bag. The Zoom technology is applied to the forefoot area. This cushioning is light and durable; and it is composed of synthetic fibers that are stuffed in between plastic. The super slim cushioning brings the feet closer to the ground and enhances stability of any multi-directional footwork. The tightly stretched fibers bounce back to shape, resulting in an explosive responsiveness after ground impact. The Air technology is applied to the heel area. It is comprised of pressurized air inside a strong flexible bag. It absorbs the impact and immediately recovers to its original shape. Traction. The rubber outsole of the Nike Air Zoom Generation has a herringbone pattern for traction. It provides durability that can support the pressure of any footwork without affecting the speed and multidirectionality of the player. In the middle of the outsole is a carbon fiber that gives additional springiness when used on the court. Length and Width. The Nike Air Zoom Generation comes only in men’s sizes. It comes in a standard width, and wearers are advised to go true to their Nike basketball shoe sizes. Lockdown. The white oval style laces of the Nike Air Zoom Generation will be adjusted to achieve the desired fit upon wearing. The structure of the Nike Air Zoom Generation provides enough stability and good support, making it comfortable for any footwork. The inside lining of the shoe uses the Nike Sphere Technology, which works by allowing air to move freely over the skin providing breathability. The thin padded layer found between the interior and the exterior follows a circular dimple pattern that helps wick away moisture. The lightness and responsiveness of this shoe come from the Phylon in the midsole. Materials may change depending on the colorway. This classic Nike Air Zoom Generation basketball sneaker comes in different colorways. The upper is covered with ballistic mesh and leather. Then, there are some color contrasts on the tongue and in the heel area, which add sophistication to the shoe. The lateral side has both a Nike callout and a glossy Nike Swoosh logo outlined with a contrasting color. The opposite has a military-style net-like feature that provides additional breathability. What catches the eye would be the semi-translucent plastic with LeBron’s name in the upper part of the tongue. His name is written in the same font as the Hummer H2 logo. Below it is the number 23, which is his jersey number as part of the Cleveland Cavaliers. The four plastic eyelets took cues from the door handle of the Hummer. The tongue is made of a combination of fabric-like material and leather that is the same as the one used on the toe box. The Air Zoom Generation is the first shoe for LeBron, but it does not actually carry his name. He first wore it in a game against the Kings on October 29, 2003. The shoe at that time is in the white and black colorway. In his home game against the Denver Nuggets on November 5, 2003, he again wore an Air Zoom Generation, but this time in white and crimson. This version is now known as the First Game, which some say is his favorite colorway. When Nike first retroed the First Game colorway, there were only a few First Game pairs that had 11-5-2003 printed on the red foam insole. A pair was sold at around $110. This shoe model is also called LeBron 1. Currently, the shoe model is sold auction-style in select high-end locations. As the first signature shoe of LeBron James, the Nike Air Zoom Generation comes in colorways that have been re-released numerous times. The majority of which are commemorative releases and player exclusives. The Christmas or Laser colorway is a white pair with a fully lasered filigree-style print on the rear, side panels, and mudguard. The colorway is a LeBron James exclusive that he wore on the Christmas game against Tracy McGrady. The First Game colorway has stirred so much controversy among LBJ fans and shoe collectors. Some insist that the white and black pair is the first shoe used by LeBron, hence the name. However, a white and red colorway is also called the First Game. He rocked this colorway in his first home game against the Denver Nuggets on November 5, 2003. The Gloria colorway represents a son’s love for his mother. The shoe comes with a white leather upper and rear pink ballistic mesh that extends to the side panels. This interesting colorway name is derived from a king’s need of a rook when playing chess. The King’s Rook is also called the OG colorway. This quickstrike colorway comes with a a textured mudguard and a black leather upper with accents of crimson and white. The King’s Rook is the last release of the signature shoe for 2017. When the King attended the All-Star festivities in Los Angeles in early 2018, he rocked an exclusive Nike Air Zoom Generation LA. The sneakers are a white pair with an LA logo at the heel and a “2018” callout on the inner . Blue and red accents are neatly distributed all over the shoe. The Leopard colorway is dressed in faux leopard fur. These LeBron James sneakers have black accents on the inner walls, shoelaces, and heel counter. The Olympic colorway made such a historical moment for LeBron James. In his rookie season, he took home the bronze medal at the 2004 Summer Olympics alongside fellow rookies Carmelo Anthony and Dwyane Wade. The shoe comes with a white base and blue side and rear panels. Red accents provide contrast. Also called the Black Pony colorway, these LeBron James casual shoes come with a glow-in-the-dark outsole while the upper is made of luxurious black pony hair. LBJ rocked an exclusive Air Zoom Generation in purple suede in the Game 3 of the NBA Finals in June 2018. It has contrasting black accents and a dark gray rubber outsole. The Rookie of the Year PE colorway was never released in public. This all-white pair features LeBron’s rookie stats 20-5-5 and the Rookie of the Year logo. LeBron James graduated from St. Vincent-St. Mary High School in Akron. The SVSM colorway is designed as a tribute to the school. The upper is made of Fighting Irish white leather, and the rear panel comes with green and gold accents. 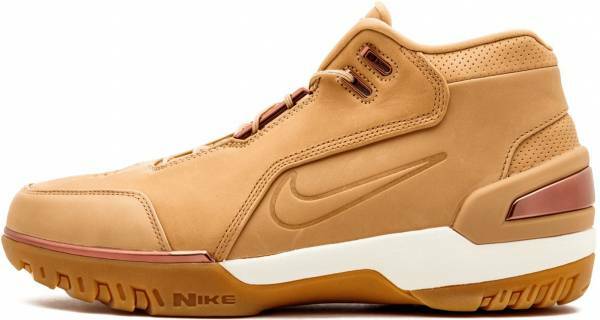 The Vanchetta Tan colorway is part of the Nike “5 Decades of Basketball” Pack. These casual sneakers are inspired by the shoe LeBron James wore in the Rising Star Challenge. The shoe comes with rose gold accents, a white midsole, and gum outsole rubber. The Wheat colorway is released on February 17, 2018. This shoe model was debuted by LBJ in the 2004 Got Milk? Rookie Challenge Game. The shoe was originally designed for the 2004 Slam Dunk Contest.